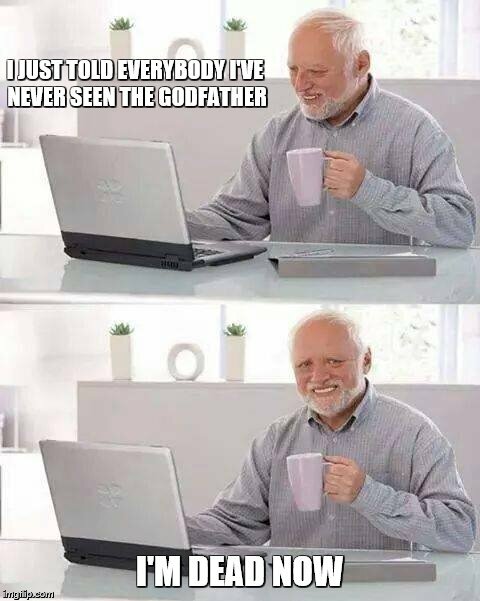 I've never seen "The Godfather." I've started it a couple of times, but it never grabs me and I end up finding something else after about 20 minutes. You are dead to RAMIUS. Please tell me you've seen the final BAR shootout. Never made it to the end. All the Godfather movies after the first. Me too. I hate boxing, and I'm not crazy about Stallone either. I'm not a boxing afficionado per se, either. I sometimes run into people who've never seen the first Rocky, and I tell them that Rocky is not a boxing film. If you're not standing on your feet and screaming, "Rocky" by the final scene, then I don't know about you. Stallone is now a born-again Christian, so I can admire him from that perspective as well. The list of movies I haven't seen is much longer than those that I have. I have never seen any of those, period. A movie I tried to watch but turned off: Dances with Wolves. This is partly because it was airing on a broadcast channel with ten minutes of commercials between five minutes of movie, but all I saw was Kevin Costner and a bunch of Indians standing around. I'd be great if someone could photoshop and substitute Marlon Brandon for this fellow. None of the Star Wars prequels or the Rockys. Some of these lists are so baffling. Maybe I'd only understand lists like this if I knew what the person actually likes. If you google "best classic movies of all time," I haven't seen most of them. I think I'll start working on that, starting with Casablanca or Gone with the Wind. I might enjoy all of them but I never seem to get motivated to see them. I haven't seen all of the godfathers either just bits and pieces. I dont know why. I know there more but can't think of any. With the exception of one of the Harry Potters, I haven't seen any of those. Blazing Saddles comes to mind.